In this story we learnt that two of the most important treasure swords of the Takeda were works of Gō Yoshihiro and Samonji. It seems that this combination was also popular among other warlords because Imagawa Yoshimoto (今川義元, 1519-1560) – who is introduced in the following – wore a daishō composed of a katana by Samonji and a wakizashi by Yoshihiro at the Battle of Okehazama (Okehazama no tatakai, 桶狭間の戦い). 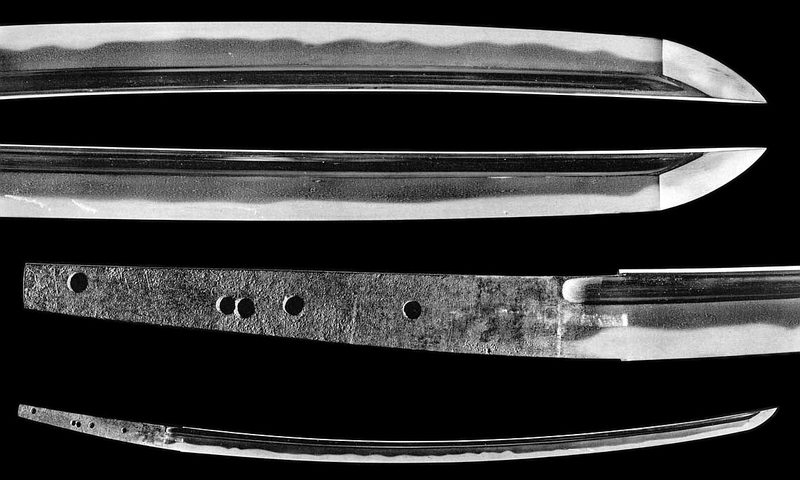 The Samonji blade was once owned by the Sengoku-daimyō Miyoshi Masanaga (三好政長, 1508-1549) who had presented it to Takeda Nobutora, Shingen´s father. In this context it received its nickname Sōzan-Samonji (宗三左文字) because Sōzan (宗三) was the priest name of Masanaga. To make peace with the Imagawa family and to become allies against the Hōjō (北条), Nobutora married his oldest daughter Jōkei´in (定恵院, 1519-1550) to Yoshimoto in Tenbun six (天文, 1537). So the Samonji blade went as a dowry into the possession of the latter and received the nickname Yoshimoto-Samonji (義元左文字). The Yoshimoto-Samonji of course was taken by Nobunaga. 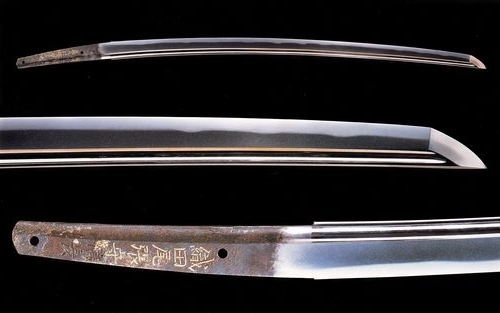 The latter had the blade shortened from the original 78.8 cm to the present-day 65.1 cm but did not forget to have the provenance of the piece inscribed with a kinzōgan-mei on the tang. This inscription reads: “Eiroku sannen gogatsu jūkunichi – Yoshimoto o uchitori kano shoji-suru katana ni kizamu – Oda Owari no Kami Nobunaga” (永禄三年五月十九日・ 義元討補刻彼所持刀・織田尾張守信長, “on the 19th day of the fifth month of Eiroku three  through the killing of Yoshimoto this sword came into the possession of Oda Owari no Kami Nobunaga”). Only several months after the destruction of the Takeda Nobunaga´s end was also near. In the fifth month of Tenshō ten (天正, 1582), when he stayed in Kyōto´s Honnō-ji (本能寺), his general Akechi Mitsuhide (明智光秀, 1526-1582) launched a surprise attack on him. Nobunaga had a mistress in Kyōto, namely the daughter of the Matsuo-jinja´s (松尾神社) chief priest, with which he shared the bed during the night in question. When they were separated by the attack she was able to escape with the Yoshimoto-Samonji which she gave to her father. An unknown source informed Hideyoshi about the whereabouts of the sword. As Nobunaga had committed suicide in the course of Akechi´s attack, Hideyoshi forced the priest to hand over the sword because he was going to avenge his master death. Later – the sword was in the meanwhile in the possession of Toyotomi Hideyori – it was presented to Tokugawa Ieyasu to put in a good word for the Toyotomi clan and Hideyoshi´s heir after Sekigahara. So the Yoshimoto-Samonji became a heirloom of the Tokugawa. When Ieyasu´s successor Hidetada became seriously ill in Kan´ei nine (寛永, 1632) he bequeathed it, together with the Fudō-Kuniyuki and the Kōsetsu-Masamune (江雪正宗),*2 to his son Iemitsu. During the Edo period, the blade suffered fire damage. Some sources say it was the great Meireki Fire from 1657, others quote the Tenmei fire (Tenmei no taika, 天明の大火) of 1788. Anyway, the gold-inlay of the signature was damaged during the fire (see picture below). The re-tempering was successful but contemporary accounts say that the magnificence of the hamon was by far no match to the original one. But the Tokugawa were happy that the precious sword had survived at all. Emperor Meiji decided in the second year of his reign to honour the achievements of the unifier Nobunaga. One measure was the erection of the Takeisao-jinja (建勲神社) in Kyōto which was completed in Meiji three (明治, 1870). The great warlord is now worshipped there as a deity and the Tokugawa family offered the Yoshimoto-Samonji to the shrine where it is still preserved today. The picture above shows the meibutsu Kōsetsu-Samonji (江雪左文字) mentioned in footnote 2. It is named after Itabeoka Kōsetsusai Tōnari (板部岡江雪斎融成, 1537-1609). Kōsetsusai was the son of Tanaka Yasuyuki (田中泰行) but was nominated by his lord Hōjō Ujimasa (北条氏政, 1538-1590) – the Tanaka were retainers of the Hōjō – as successor of the Itabeoka family. When the conflict between the Hōjō and the Toyotomi worsened in the 18th year of Tenshō (天正, 1589), Kōsetsusai was one of the mediators between the two sides. It is said that Hideyoshi saw the genius of Kōsetsusai during these negotiations and even served him tea in a private tea ceremony. One year later Hideyoshi destroyed the Hōjō at the Siege of Odawara (Odawara-seibatsu, 小田原征伐) and Kōsetsusai became a member of the otogi-shū (御伽衆), a group of close confidants who kept company with the shōgun (or a daimyō) on various occasions. In return Kōsetsusai presented Hideyoshi with the Samonji. Hideyoshi in turn gave it to Ieyasu from which it went to the Kii branch of the Tokugawa and became a highly treasured heirloom. But there also exists another tradition. After Hideyoshi´s death, Kōsetsusai joined Ieyasu’s side and was appointed as a messenger at the Battle of Sekigahara to convince the undecided Kobayakawa Hideaki (小早川秀秋, 1577-1602) to fight for the Eastern Army. Hideaki did so in the end and it is said that Kōsetsusai received the Samonji-tachi as a reward. After Sekigahara, Kōsetsusai´s second son Fusatsugu (岡野房次), who was adopted into the Okano family, became a retainer of Tokugawa Yorinobu (徳川頼宣, 1602-1671). The latter was the founder of the Kii branch of the Tokugawa and so it is assumed that the Kōsetsu-Samonji came to the Kii-Tokugawa via this connection. However, the blade is nowadays designated kokuhō and is the one and only extant long sword by Samonji with a signature. Before we turn to other swordsmiths I would like to introduce another meibutsu by Samonji, namely the jūyō-bunkazai Sayo-Samonji (小夜左文字, see picture below). A legend says that the blade, a tantō, was once in the possession of a rōnin from Nissaka (日坂, present-day Kakegawa City, Shizuoka Prefecture). When his wife died of illness and left him with their son, he decided to part with his beloved tantō. Nissaka was a station on the Tōkaidō (東海道), the main road which connected Kyōto with the eastern Kantō provinces. So his first goal was the next Tōkaidō station, Kanaya (金谷宿). For this he had to cross the notorious pass Sayo no Nakayama (小夜の中山・佐夜の中山). 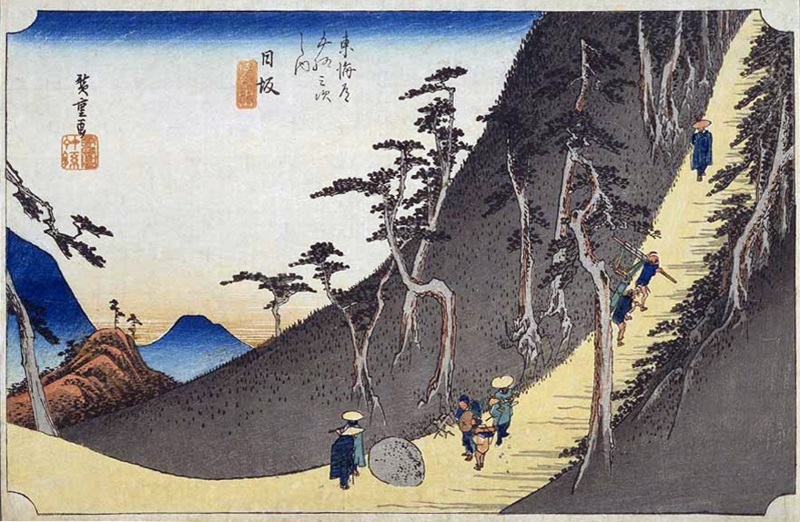 This pass had always been regarded as one of the most dangerous passages on the Tōkaidō because many robbers and highwayman were lurking there at night (see picture below). And promptly, the man was killed at the top of the pass and his Samonji-tantō was stolen. The climb to the Sayo no Nakayama pass from Nissaka. After a woodlblock print by Utagawa Hiroshige (歌川広重, 1797-1858). The local inspectors later informed the orphan about the circumstances of that night when he came of age. He swore revenge but his only thing to go by was the Samonji tantō. So he decided to enter apprenticeship as a sword polisher in the nearby Kakegawa (掛川)*3 because this might be the best and only chance to stumble on the blade. And he was dead right! About 15 or 16 years later a prowler entered the workshop to have his tantō polished. When the young man removed the hilt to prepare the blade he saw the signature: “Chikushū-jū – Sa” (築州住・左), distributed to the front and the back of the tang, as it is typical for Samonji and as was the signature on his father sword. When it was time for the customer to pick up the finished blade he asked him how come he was wearing such a fine masterwork. But the man involved himself in contradictions and so the polisher rushed ahead: “You got the blade by murdering and robbing someone, didn’t you!” According to the customers reaction and the change of face he hit the nail on the head and so, without hesitating, he thrust the blade into the murder’s stomach. Thereupon he gave the tantō the nickname Sayo-Samonji and it became one of his favourite pieces. After Yūsai´s death it was bequeathed to his son Tadaoki (細川忠興, 1563-1646). It is said that Tadaoki sold it, together with the famous tea caddy Ariake (有明, lit. “dawn when the moon is still in the sky”), using the proceeds to fight a serious famine raging in Kan´ei four (寛永, 1627) in his Kokura fief (小倉藩). But this tradition has to be taken with a grain of salt because Tadaoki surely did not have to sell a tantō and a tea caddy because the Kokura fief had the high income of 400,000 koku. *4 The tradition says further that the Sayo-Samonji then went to the Kuroda (黒田), the Asano (浅野), the Inoue family (土井) and to a sword dealer in Kyōto. There it was found in the course of the nationwide search for famous blades initiated by the eighth Tokugawa-shōgun Yoshimune. Until the Meiji era the piece was probably in the possession of the Tokugawa family, but more details are unknown. In the end, the tantō was bought by the swordsmith Shibata Ka (柴田果, 1774-1953) who had a preference for Samonji and who also made several copies of his works. Today the meibutsu is owned by the Ōsaka pharmaceutical company Brast Sheave Co., Ltd. By the way, Shibata named his tea room after the dagger, namely Sayosa´an (小夜左庵). *1 Their name comes from the black horo. This was a special cloak which blew up to a ball when riding at speed. *2 Not to be confused with the meibutsu Kōsetsu-Samonji (江雪左文字). *3 Kakegawa was the Tōkaidō station to the west of Nissaka. *4 This was only 140.000 koku less than the later Kumamoto fief which was ruled by his son Tadatoshi (細川忠利, 1586-1641).